Penang is a Malaysian state located on the northwest coast of Peninsular Malaysia, by the Malacca Strait. It has two parts: Penang Island, where the capital city, George Town, is located, and Seberang Perai (formerly Province Wellesley) on the Malay Peninsula. The second smallest Malaysian state by land mass, Penang is bordered by Kedah to the north and the east, and Perak to the south. Penang Hill – Penang Hill or Flagstaff Hill (Bukit Bendera) as it is officially known, rises 821 metres above sea level, providing a welcome break from the heat below. 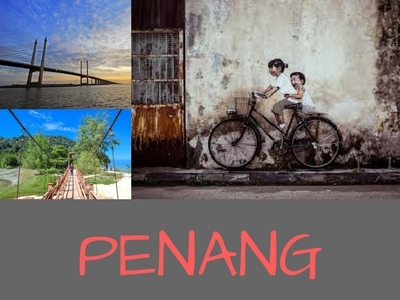 One’s Penang most popular attractions, a trip up is not-to-be-missed experience. Cheong Fatt Tze Mansion – The home of an influential Chinese industrialist in the early 1890s, the award-winning Cheong Fatt Tze Mansion represents the best of 18th and 19th century Chinese architecture. Penang Interactive Museum – The made in Penang interactive museum really helps shake off pre-existing ideas of boring, outdated museum, instead offering visitors a fun, exciting way to view artwork with exhibits that have clever 3D imagery features. Penang War Museum – Built by the British army on top of Bukit Maung in the 20th Century, the museum is historically significant for its past. Used as a Japanese army base during WWII, tales of prisoners of war being tortured for information colour its walls. Batu Feringgi Beach – Batu Ferringhi is a beach resort northwest of George Town, on Malaysia’s Penang Island. It’s known for water sports and seafood restaurants. Street food, household goods and batik clothing are sold at the seafront night market. Batik pieces are also on display at local galleries and shops. To the west, the Tropical Spice Garden has spice terraces, a bamboo garden and tropical flowers. Tanjung Bungah Beach – Tanjung Bungah is a suburb of George Town in Penang, Malaysia. It is located along the northern coast of Penang Island between Batu Ferringhi and Tanjung Tokong, and about 6.5 km northwest of George Town proper. The Penang National Park - spans 1,213ha of land and sea and is used by scientists, researchers, and nature lovers to explore its natural treasures.